Despite many victories, communities around the world are still facing a plague of industrial wind projects that like hideous War of the Worlds steel monsters are destroying communities, mountains, and wildlands, slaughtering birds and bats, sickening people and driving them from their homes. Even though these wind projects do not reduce greenhouse gases or fossil fuel use, they have dreadful environmental, social and economic impacts on whole regions. But they are a tool for energy companies and investment banks to make billions in taxpayer subsidies that get added to our national debt. The good news is that communities worldwide are learning how to defeat these dreadful projects. More and more laws and moratoriums are being passed against them, while other projects are defeated on legal grounds or by overwhelming public opposition. This battle was led by I Aloha Molokai of which Mike was one of the founding members. This was the IAM’s first powerful film produced by PF Bentley. It set the stage for the community-wide battle. 1. Show wind projects for what they are: industrial. Not environmental, not green, not renewable, and cause no reductions in greenhouse gases or fossil fuel use, no long-term jobs and few short-term ones. 2. Don’t be nice. These wind developers are your enemies: they want to destroy where you live, steal your money (property values), and are quite happy to literally drive you from your homes. They will lie, cheat, bribe, buy politicians, and do whatever else they can to win. They won’t be fair and you can’t trust them. 3. Create a group and get your community behind you. Point out property value loss, human health issues, environmental destruction, tourism impacts, and all the other dreadful results of industrial wind. If you have a homeowners’ associations, make them aware of the danger so they can join the fight. 4. Publicize your case. In the newspapers, TV and radio and video, on blogs and in nationwide petitions. Use good graphics. Go viral, worldwide. Develop a good professional website with lots of information and ways for viewers to participate. Community members should write op-eds and letters to the editor. A very powerful tool is frequent press releases that pass on news reports from National Wind Watch and other groups about the devastating impacts of industrial wind. These press releases should be sent to all relevant media outlets and local, state and national legislators. 5. Do mailings to everyone. In Molokai we sent two mailings to all the island’s 2,700 addresses. The first mailer described the dangers of the project and included a survey with a stamped return envelope. We had a massive response, with 97% of responses against the project, and our group gained hundreds of new members. A year later we sent a second mailer with photo mockups showing how the turbines would tower over homes and landscapes. This mailer also included a bumper sticker which many residents then put on their cars. 6. Be visible. Put up lots of signs, both homemade and professionally done. Put up billboards if you can. Professional signs show you mean business, and are taken more seriously. 7. Find legislators who will help you. On the state level, Republicans are often more responsive and more concerned about the environment than traditionalist Democrats who have bought the idea that wind is environmental (or who are receiving contributions from wind companies). 8. Litigate. Find every avenue to impair or slow the wind developers. Once the Washington industrial welfare subsidies are removed, industrial wind companies will vanish overnight. 9. Get property value loss appraisals. Average losses of 40% or more are being reported; in Molokai, one of the reasons the landowner planning the project cancelled it was they estimated a 75% property value loss on their lands near the project. Publicize the loss of assessed value at county level, and how that will reduce tax revenues. In most cases, property value loss far exceeds any revenue the county might receive from the project. 10. Civil disobedience. Politicians and energy companies are terrified of this. Don’t be afraid to go to jail to protect the land and homes you love. On Molokai we planned if necessary to start a hunger strike on the island, and there were people ready to starve to death to protect our island. The level of your commitment is equal to the level of your success. 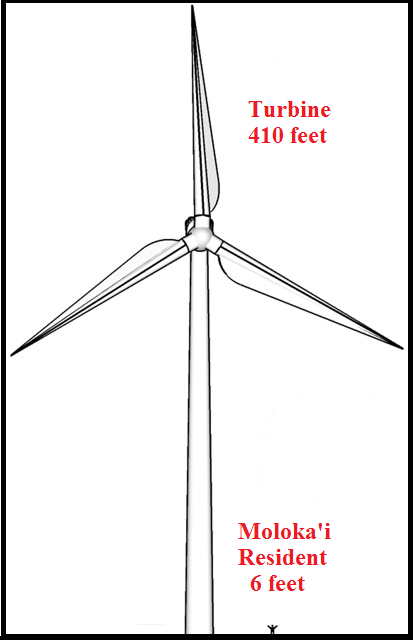 In February, 2013, Hawaii’s online newspaper Civil Beat reported that the Island of Molokai had won its battle to protect its aina from and industrial wind project — Big Wind is Dead. I’d like to suggest one more tactic for your list. Most people will trust others until they prove untrustworthy. It’s up to those who oppose the project to publicly point out every instance of a wind developer lying, cheating, bribing or misleading the public and the permitting authorities. Over time the people will learn to scrutinize every claim they make.